I need you to listen closely. I need you to believe me when I tell you what happens. I need you to say the word “fat.” About me. Because I am. I’m a size 26 — fat enough that some stores for fat people don’t carry my size. Fat enough that some doctors will refuse to see me. Fat enough that getting on an airplane makes my blood run cold, because they might kick me off, without a refund for my ticket, or they might charge me double, and then I will have to explain to my friends, job, family why I can’t make it on that trip. Every discussion about bodies — whether in the media or amongst friends — is about how to avoid the horrible fate of looking like me. I need you to hear that this is all hurts, and happens all the time. I know that this stuff is hard to talk about. But when I talk about fat, I am not talking about feelings or self-esteem or body image issues or inner strength. I am talking about the way individuals and institutions treat me and people who look like me. I need you to acknowledge that you and I have different experiences because I am fat. I know that all of us are impacted by body shaming, and that everyone has real, valid, deep, hard feelings about our bodies. I still need you to stop perpetuating it, especially when talking about yourself. No amount of caveats or prologues make it hurt me less. I need you to know that I’m taking it personally because it is personal. 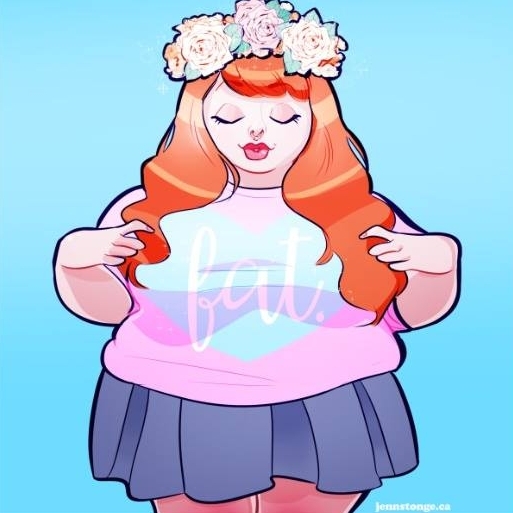 I need you to know that I go to great pains to take care of everyone’s feelings when I talk about being fat, and that, for me, these conversations happen weekly, sometimes daily, and lots of people need lots of attention and care just to be able to hear what I need from them. Sometimes I get tired, frustrated, or angry with the emotional work it takes to just to prepare those around me to hear me name who I am and what I need. I need you to let go of the things I have never been able to hold, just for a moment. Just to feel how fragile they are when you loosen your grip, to feel how easily they can shatter. I need you to care for me enough to feel unsafe. I need you to join me for a moment where I live every day. I need you to try to learn to love the lush overgrowth of your body. Let it grow wild and untamed as a garden you loved as a child. Love it for the way it sustains you, keeps you warm, goes to such lengths not to let you get hurt. Its only job is to care for you. I need you to try to love it if you intend to love me. I need you to remember what you know from feminism: that blaming individuals for the harassment they experience isn’t supportive or effective.That we question social messages and systems of power that dictate what our bodies are and aren’t allowed to be. And that hysteria and neurasthenia (weak nerves) were very serious health concerns at the time, and they were used to contain and discredit women who wouldn’t comply. I need you to remember what you know from economic justice: that individual work ethic can’t hold a candle to the systems stacked against us.And we can’t attribute poverty to poor work ethic any more than we can attribute harassment of fat people to low self esteem or weak willpower. I need you not to forget your social justice values when I tell you about my experience. I need you to stop reducing my experiences to hurt feelings, or to ill-intended individuals. I need you to know that even with good intentions, you can still do harm. I need less empathy and more solidarity. Less pity, more anger.Fewer condolences; more action. I need you to stop comforting me. When you ask me what I need, and I tell you, I need you to try. Like this piece? There are two more like it: A love letter from your fat friend and From your fat friend: let’s talk about fatphobia.